The Astable Configuration is like an Oscillator with a Square wave output. You can adjust the Frequency and Duty Cycle (means off time and on time pulse width as a %). The variation is done by playing with the caps and resistors while looking in One Eye at the Sacred Formula. Do not overload the output pin or let high voltage/spike reach any pin.. Do not reduce the the resistor to Pin 7 or Discharge transistor, too much, it will burn out! Press the Red button below to turn on the circuit press it again to turn off. The 555 can source (LED2) or Sink (LED1) upto 200mA. It can even drive a small motor or lamp with diodes added to protect from inductive kickback. 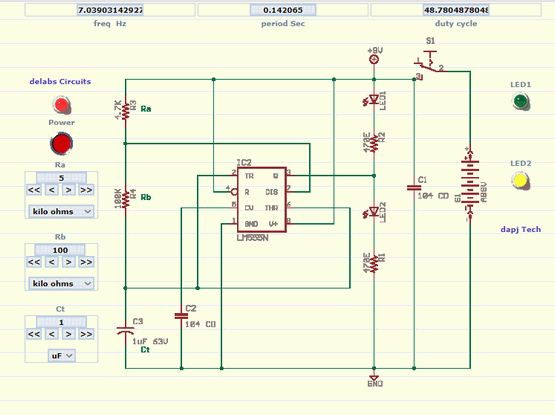 Astable 555 Multivibrator xml use iframe part for your Webpage or Blog.